Ontario Standardbred owner Brad Grant of Milton, Ont. said it will be next to impossible for him to top 2018, so he will simply have to cherish the memories for as long as possible. Grant started the year by winning three O’Brien Awards, which celebrate the best in Canadian harness racing, then went out and won the Hambletonian with his trotting filly, Atlanta, two legs of the pacing Triple Crown with his colt, Stay Hungry, and was inducted into the Milton Sports Hall of Fame in November for his time owning and operating the Milton Merchants Junior Hockey Club. Atlanta certainly knew what it took when she defeated a group of the best sophomore male trotters in the world in August to claim the $1 million Hambletonian at the Meadowlands Racetrack in New Jersey, which made her the first filly in 21 years to accomplish that feat. Atlanta is trained and owned, in part, by Rick Zeron of Oakville, Ont. and was driven to victory by his son, Scott Zeron, for partners that included Grant, fellow Ontarian Bill Holland of Niagara-On-The-Lake, Ont., as well as Americans Howard Taylor and Michelle and Albert Crawford. The Cane Pace was the first leg of the Pacing Triple Crown. Stay Hungry also won the second leg, the Messenger, while defeating Ontario-sired superstar Jimmy Freight at Yonkers Raceway. 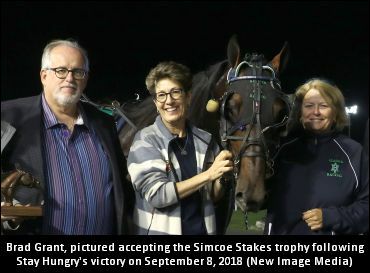 Grant, the leading Standardbred owner at Woodbine Mohawk Park, started the year by winning O’Brien Awards for his horses Stay Hungry (Canada’s two-year-old pacing colt of the year), Bettors Up (three-year-old pacing filly of the year) and Sandbetweenurtoes (older pacing mare of the year). It was the first time Grant has won an O’Brien Award despite a long career owning horses. Though, he was present the night in 2001 when his father — the late Canadian Horse Racing Hall of Famer John Grant — collected O’Brien Awards when Ontario-based stallion Bettors Delight was named Canada’s Horse of the Year and three-year-old pacing colt of the year.